The memory fades over time but there are steps you can take to improve it. These help with improving the short term and long term memory, which will aid with remembering names and faces as well as information for school work, reports, exams and speeches. 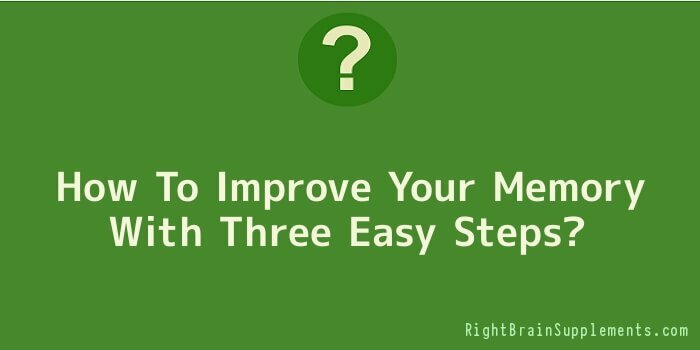 Here are three easy steps on how to improve your memory. People hear on a daily basis how exercise is important. Exercising the body is but so is exercising the brain. This isn’t as hard as it sounds. It is possible to exercise the brain on a daily basis by doing crosswords, Sudoku puzzles, word searches and brain training exercises on games consoles. Physical exercise will also help with how to improve your memory. By exercising, you will increase the amount of blood that flows around the body; increase the amount of oxygen reaching the brain. This helps to keep the brain healthy so that it can store more information and recall it on a daily basis. You will also find that your attention span increases as your brain doesn’t need as much rest than if you limit the oxygen reaching it. Sleep is essential for the body and the brain. Your brain works through everything that you have been told, learned or heard about throughout the day during sleep and helps it soak into the subconscious. This directly improves your memory as you will be able to retain more information and then recall it. Everybody is different but most people need between six and eight hours sleep a night. Stress is not good for you; period. Stress makes you feel older, means that your brain is focusing on so much already that it cannot retain information and makes you struggle with just the daily tasks. Reduce the amount of stress in your life. If you can’t do something about an event, why worry about it? Money is a common cause of stress so take control of your finances, budget and plan ahead; you will soon find that you remember more throughout the day. Three steps on how to improve your memory. The hardest is probably avoiding stress, which actually prevents you from sleeping well. However, by taking control of your life and training your brain, you will feel better and remember more.